Our first sail on the Monterey Bay was on my birthday, May 18th. The Santa Cruz Yacht Club was hosting a blessing of the fleet from 12 to 2 in the waters near the Santa Cruz Municipal wharf. Our boat is in Moss Landing, which is about 15 nautical miles from Santa Cruz. Seemed like a great way to introduce Pablo to her new home waters and a wonderful way to celebrate. We left Moss Landing around 9:30 with the giddy excitement of two children on Christmas morning. The forecast was for 10-12 knot winds from the west. Our destination was west and since we wanted to make it to the blessing on time, we would motor there and sail back. So there we were on a beautiful, magical, sunny day. Motoring our way into light winds and low swell. Steve decided to raise the main sail to get the boat more stabilized, however the sail would not cooperate. Steve cranked, readjusted the topping lift, readjusted the reefing lines, and tried again, the damn thing would go up, but only partially. It all just seemed to be more difficult than it should be, so we decided to leave it down until we could get into a better location to look at it. As we continued our trek west we noticed the windline change dramatically and there was a tangible change in the air. It wasn’t long before the winds and seas started to build, oh goody, now we would have the chance to see how Pablo could ride the seas. We grinned into the wind and marveled at how well she cut through the swell. We had been operating the auto pilot, which was doing a wonderful job when the attachment bolt on the tiller sheered off. OK, so now we are hand steering dead into 15-20 knot winds and choppy 4-6 foot seas. This doesn’t really seem like the dreamy vision I had of our celebration sail. We were quickly reaching that “this isn’t so fun anymore” state. We checked our navigation, checked our speed, and realized that we would not make it to the blessing on time. Even if we did, it would be a miserable ride and who does that if you don’t have to? So we decided to turn back and head for our dock and a nice celebratory cocktail. Once the wind was behind us we had the bright idea to raise the sails and cut the motor. After all, we had been discussing the issue with the main sail and realized what we were doing it wrong. We needed to pull her up with the topping lift first to release the stress on the sail so we could raise it easily. After several attempts and lots of boat yoga on the deck, Steve finally got the sail up to a somewhat satisfactory state. Now for the jib. Hah! The halyard twisted around the forestay halfway up. This meant that Steve was flailing around on the foredeck trying to keep the jib from dropping into the water and untangle the halyard all while doing his best not to go swimming. (Thank you God that we always wear our PFD’s and we rigged up jack lines). With much wrangling, Steve finally got the jib up. Now we were sailing. Although we were no longer grinning or really even having much fun anymore, we were determined to achieve some level of dignified sailing. As I stood at the tiller, while Steve panted and recovered from his sail wrestling, I was smuggly thinking, “ok, we can do this. It’s not that hard”. Suddenly something came whipping past my face so fast I did not really register that it was anything important. Then it whooshed past me again. What the….. it was our running back stay. It had come loose. Our running back stays are secured to eye bolts on the deck and are not used unless we are sailing with main and staysail alone. They provide the counter pressure on mast for the staysail if were not using the jib along with the staysail. So we weren’t in any real danger other the fact that there was a 1/4″thick steel cable flying around our heads that could have easily injured either of us. The whole pirate thing is cute and all, but I don’t really want to wear an eye patch. Now Steve and I are jumping up and down in the cockpit trying to catch the damn thing and scared to death it is going to hurt like hell if it hits us first. I can’t recall who caught it, only that I was relieved to tie it back down on deck. All the while Pablo is like a runaway horse. She has a single reefed main and a full yankee jib flying downwind with Frick n Frack at the helm. We move into a broad reach but now her weather helm is so strong I am holding onto the tiller with both hands and she is being hit broadside by each wave. OK, this is definitely NOT fun anymore. Captain Steve and I decided to call it a day. It was time to lower those sails and motor her home. Steve shimmies his way onto the foredeck to drop the jib. Now, I am in the cockpit holding onto the tiller using my left hand and full body weight while holding onto the jib sheet in my right hand. All while the 15knots of wind are trying to tear it loose from my grasp. Steve is rolling around on deck, I am doing cockpit aerobics and it seems like an eternity before the damn jib drops to the deck. Now for the main sail. Should be no problem. Right? During the whole sail dropping process the topping lift came completely loose and we spent several hair raising, boom swinging, moments trying to get the situation under control. To say that we were exhausted would be an extreme understatement. We finally got our girl safely back to dock. Or should I say that she got us there. We spent many days debriefing our experiences, hashing out the things we did wrong and analyzing the whats and whys of how much trouble we had. In the end we realized that we were not in control of our boat. We will never be able to follow our dreams if we don’t get her under our command. We have a lot work ahead of us. Practice, skill building, lessons, and practice. We are not afraid (mostly), but we would be foolish to think we are prepared. We still celebrated our first sail in Pablo’s home waters. Although we lifted our glasses with sore and bruised arms. We were still blessed by God’s hand of mercy and with the lessons learned about ourselves and our strengths, our skills and our determination. Life is oh so sweet when you take the chance and chase a dream. 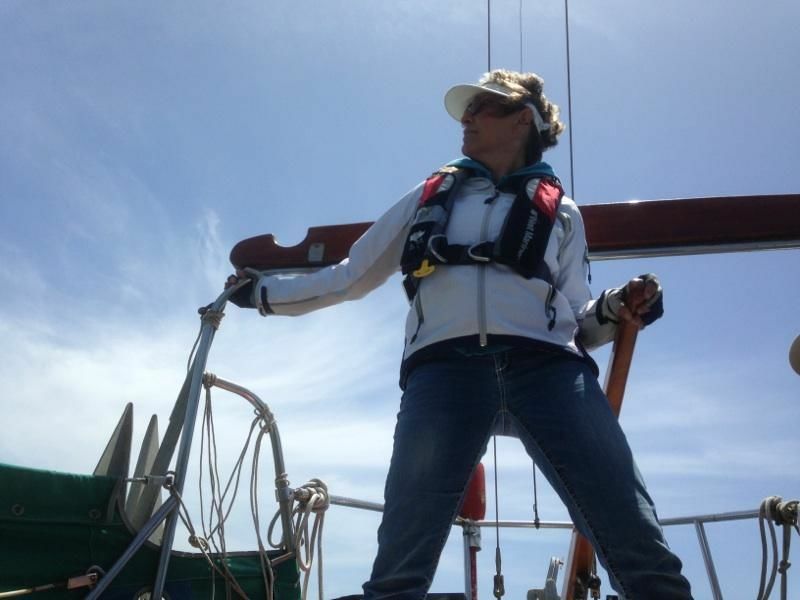 This entry was posted in Uncategorized and tagged Learning, sailing. Bookmark the permalink.